Below you can read about Pteroglider's features, learn the basics of gameplay and check the system requirements. What's more, the groups of enemies attack in a random order, so no game is exactly the same! Whatch out, some of the combinations are deadly ! Pteroglider is very simple to play. After you create a profile (New -> Enter Name -> Accept) in the main menu, you can start playing the first stage on the first difficulty level. You can do this by selecting the profile name from the table and hitting Start button twice. 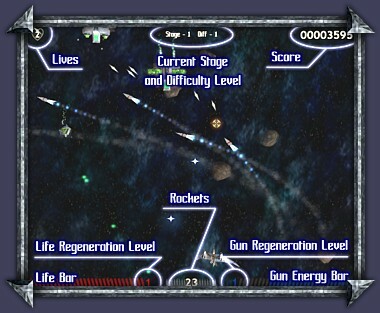 The objective of the game is to destroy as much of the enemy vessels that show on the screen as possible while avoiding to crash into them and their shots. You accomplish this by moving your biomechanical pteranodon with the keyboard arrows, and targeting/shooting with the mouse. You have two kinds of weapon at your disposal - laser gun activated with left mouse button and guided missiles launched with the right mouse button. The screen below is taken from the in-game help. It shows the graphical user interface elements of the game that indicate your current health, energy, score, etc. You will be seeing many of these during the game. Collecting loads of Point Stars is the key to high scores in Pteroglider. This booster, known as the Max Life, will help you in those tough situations, and instantly restore your life to maximum. When your gun consumes all energy, it slows down its firing speed. The Max Energy booster will restore your reserve to maximum. A good missile strategy defines a good Pteroglider player. The Extra Rockets booster will increase the number at your disposal. When you start a new game your gun will shoot single lasers. With the Gun Upgrade you can increase up to 5 the number of shoots and up to 15 its damage level. Especially handy in the higher difficulty levels, the Life Upgrade booster will increase your life regeneration level. A better gun consumes more energy, so you must constantly watch it! The Energy Upgrade booster helps a lot by increasing your gun energy regeneration. The Bingo Bonus is a real treat among power-ups. For some time the screen will be blithering with the windfall of Point Stars! For the most part of the game each missile launch must be carefully planned. But with the Rocket Boost for some time you will have an unlimited number of them! By collecting the Life Boost you will gain a temporary immortality. Again be careful with this one, because it does not protect you from crashing into bosses. With the Energy Boost on, firing your gun will not eat your reserves. Collecting this booster will also restore your energy to maximum. Finally the Extra Live, when none of the above have helped, be sure to have some spare Lives, just in case a crazy Bat Winged creature hoops in from the side and knocks you down! The game also requires the DirectX 9.0 runtime to work. You can get it online from the Microsoft DirectX web site. Pteroglider has been tested on many system configurations, including graphic cards from both ATI and NVIDIA, but the best way to determine if your system is compatible, is to check out the free demo version.